This article originally appeared in The Japan Times and has been published with the permission of its author Yukari Pratt. Yukari writes for Tokyo`s Metropolis magazine and for the The Japan Times. She has contributed to the guidebook, Time Out Tokyo and to Time magazine. Yukari has been profiled in GQ Japan and The Daily Yomiuri. A Japanese food fanatic, whose mother is Japanese, she is on a mission to bring the food of Japan to as many people as possible. Her hobbies include soaking in "onsen" hot springs, drinking shochu, fly-fishing and motorcycling. When the summer heat sets in, my Japanese mother religiously serves hiyayakko (chilled tofu) sprinkled with katsuobushi (bonito flakes) and soy sauce. Just looking at this simple dish, I feel myself starting to cool down, knowing that tofu actually helps lower your body temperature. Natural refrigerant, anti-cancer agent, cholesterol combatant - the list of tofu's reputed health benefits is long. It is difficult to overrate just how good tofu (made from soy beans) can be for your health. "I think soy has the potential to be a magical ingredient," said Jacqueline B Marcus RD, a food and nutrition consultant from Northfield, Illinois. "Research in several areas of health has shown soy may play a role in lowering risk for diseases such as heart disease, osteoporosis, diabetes and cancer." "Soybeans contain five classes of compounds that have been identified as anticarcinogens," Marcus said. "Further, research indicates soy protein may help lower blood cholesterol." Soy products have many reputed health benefits and conveniently comes in an astonishingly wide variety of forms, including noodle-like somen tofu (left) and "Charisma" tofu with whole soy beans. Foods made from soybeans have varying amounts of isoflavones, plant compounds with weak estrogenic activity that may be one of the key factors in disease protection, according to Marcus. There are also benefits for post menopausal women. However, Marcus notes that, "Although tofu is relatively low in calories, it does have a fair amount of fat." She suggests 2 - 3 servings a day: a handful of edamame, plus a cup of soy milk, or some tofu over a salad. "In the US, the allowable health claim on food labels states that 25 grams of soy protein daily may lower disease risk, but no formal recommendation for daily isoflavone intake has been established," says Marcus. "While there is still so much to learn from Asians whose diets have typically been rich in soy, there are many unanswered questions for Westerners who may just be introducing soy into their diets. Until more is determined, it may be best to eat (it) moderately with balance and variety, and include soy as part of a wholesome diet," she adds. But soy is not just a health food, and after all that talk about health and diets, Marcus wanted to provide her own recommendations for how to use soy milk: in pancakes, French toast, hot chocolate or in a smoothie. Tofu is a versatile ingredient that comes in a wide variety of forms ranging from savory to sweet. Of course, it often gets a bad rap for being plain, and that is no surprise. I remember as a child growing up in the United States, and discovering, with bewilderment and some disgust, that a friend's family stored their tofu in the cupboard, and that it had a shelf-life of one year. But it is time to abandon that image of tofu as a hippie's flavorless substitute for meat. One would be mad not to explore the many different types of tofu that can be found in Japan. It actually tastes good here. One of my summer favorites is tofu somen, which comes as delicate, thin strands of tofu that could easily be mistaken for somen (wheat) noodles. Another unique tofu is edamame-studded and curiously named "Charisma" tofu. For a change of pace, there is always deep-fried tofu: abura-age (thin style) or atsu-age (thicker version), which adds an extra layer of richness to miso soup. The abura-age can be cut into thick strips, toasted in the oven and used as crouton toppings for a salad. My latest crave is cheese stuffed into abura-age and slowly sauteed until the cheese comes oozing out of the packets. The production of tofu is surprisingly simple. Soy milk is coagulated with nigari (magnesium chloride, which can be extracted from sea water), explains Yukiko Hayashi, author of the cookbook "Tofu Zanmai (Tofu Obsession)." Running through the four main types of tofu, Hayashi explains that Momen dofu is firm and good in stir-fries or rolled in almonds or sesame seeds and sauteed for tofu steak. Kinugoshi dofu (silken tofu) is her recommendation for miso soup. One (adapted) dish from her cookbook that packs a lot of punch is garlic, peanuts, chirimen jako (baby sardines) and sakura ebi (dried shrimp) sauteed in oil and poured over kinugoshi dofu and seasoned with Thai nam pla fish sauce. For a Korean twist, try a dressing of chopped raw tuna, kimchi, soy sauce, sesame oil and salad oil. Zarudofu and yosedofu have a high water content and therefore are very soft on the palate. Zarudofu is served in a zaru, or woven basket, hence the name. Both have an inherent amami, or sweetness, to them, and Hayashi suggests serving zarudofu with top-quality olive oil and sea salt, or alternatively grated ginger or nerigarashi (Japanese mustard) with soy sauce. Hayashi also suggests cooking with soy milk, which has about half of the calories of regular milk, though she warns that it has a strong aroma. Therefore it is best served with strong-flavored drinks such as a well-brewed cup of tea or cafe au lait, or incorporated into a stew or gratin. For a silky, rich chocolate pie, melt 1 1/2 cups of chocolate chips. Meanwhile, soften two 280 gram packs of room-temperature kinugoshi tofu in a blender, then fold in the melted chocolate chips and mix until combined. Pour the mixture into a pre-made pie crust and let it set in the refrigerator until firm. It is hard to believe it was made with tofu, and it is confounding to think a food can be so yummy and still good for you. While the potential health benefits may be the motivation for some people to explore tofu, the real test of how good a food is is always the taste. 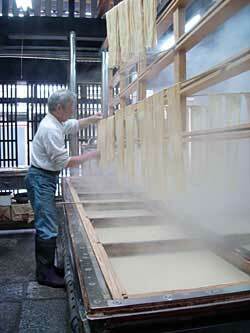 Kyoto business Yubahan has been making yuba since 1716. Homemade tofu may be the easiest Japanese dish you will ever make, bar none. You may find yourself, as I did, shaking your head at the pot thinking, "it's that easy, and this delicious?" Check the tofu corner of your supermarket, not the dairy section where you find regular soy milk, for a bottle of soy milk with a small packet of nigari (magnesium chloride) attached to it. Warm the soy milk over medium heat until bubbles start to form. Take it off the heat, add the little pack of nigari, stir a bit and, as it starts to curdle, stop and let it rest. Spoon it into serving bowls and top with a citrusy-soy ponzu. 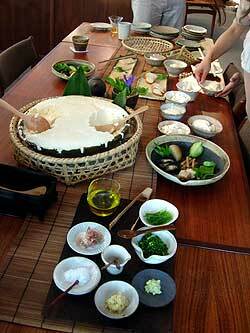 If you are up for a more difficult dish, Hayashi suggests making yuba sashimi, a classic dish from Kyoto, from scratch. Creamy, delicate layers of yuba tofu garnished with freshly grated wasabi and a splash of soy sauce is an elegant appetizer. The layers of yuba are creamy yet chewy, with a strong, nutty soy profile. The first step is to get good quality tonyu soy milk from your neighborhood tofu shop. In a large Teflon pan, add the soy milk - a large pan gives you a larger surface to make the yuba from and the Teflon coating helps prevent the soy milk from burning. Apply strong heat and, just before it begins to boil, drop the heat to low simmer. Be patient as the skin slowly forms on the soy milk. With a pair of long chopsticks, gently pick up your piece of yuba and set aside in a serving dish.